Let's not mince words or waste time. Batman: Eternal #11 is one of the worst comics I've seen in recent memory. Indeed, I'm not sure what aspect of it troubled me most. The idea of Alfred the Butler being a deadbeat dad who abandoned his wife and daughter? Barbara Gordon being depicted as a thoughtless thug? The artwork that seems more appropriate to an issue of Heavy Metal than Batman? How about all of the above? The main focus of the issue is on Batgirl as she storms a South American television studio in broad daylight, seeking an actor who she has determined was involved in framing her father for murder. Hilarity ensues as the actor is also chased by adoring fans and a supervillain. The issue also features a subplot involving Alfred trying to make amends with his estranged daughter - an MI6 agent who just happened to wind up in Bruce Wayne's care. There's also some brief vignettes involving Catwoman that probably mean something if you've been reading her book (it isn't explained well) and Stephanie Brown researching her father's criminal past. To say that Batgirl is horribly out of character in this book compared to how she is depicted in her own title would be an understatement! How is it possible that I picked up three comics this week and the one featuring a murderous berserking redhead didn't have "Red Sonja" in the title? Barbara Gordon is a thinker. A planner. She does not lose control and she does not lose her temper. Her major defining flaw in recent years has been being too cool and clinical - not being a cliche fiery redhead or Irish spitfire. And she certainly doesn't need the likes of Jason FRELLING Todd giving her lectures on self-control! The artwork by Ian Bertram isn't all that bad but it is ill-suited to the story in question. 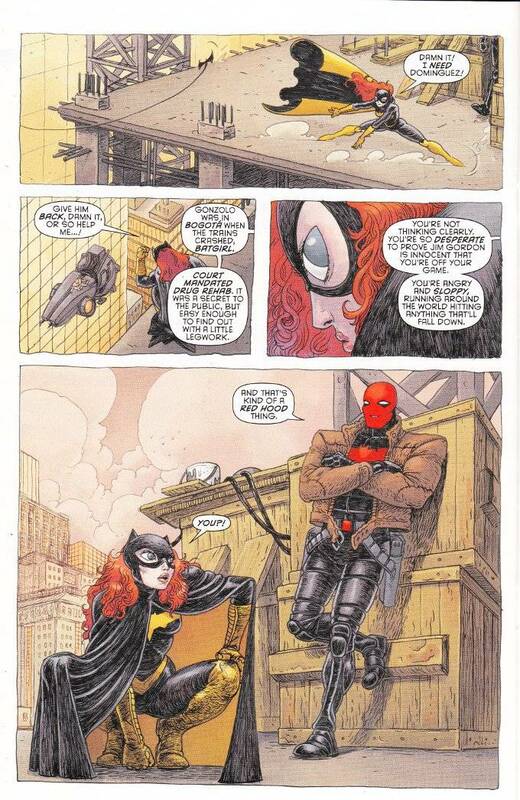 It has a quality that is reminiscent of Frank Quitely, though Bertram draws bigger eyes than he does. It also makes me think a little bit of the exaggerated yet detail-driven style of Simon Bisley, though Bertram's style is much cleaner and brighter. In any case, this look just doesn't fit the aesthetic of Batman very well and the whole book looks odd as a result.